Elsie opened this first, well attended, meeting of the new season with two announcements. First the presentation, to Ken Norris of the ABPS Congress Medal, 2006 for "many years of service to philately in Scotland" (GSM, October 2006, page 110) and the sad passing of Ed Murray from East Kilbride. Elsie then gave her display based on the Old Testament. She mentioned that there were three types of books; History, Poetry and Prophecy. From Genesis she showed through stamps, minisheets and covers the creation of man, and woman, through to Moses, Noah. Her stamps came from many countries which included Israel, Jersey, Kenya, South Africa and Jordan (amongst others). For her second round Elsie continued through the books starting with David and the receiving of the waters at Bethlehem through Solomon and Elijah to Psalms with mention of the gates of Jerusalem and the Waters of Babylon and the Dead Sea Scrolls. She ended up with Isaiah, Ezekiel and Malachi which looked forward to the coming of the Messiah. Derek Wilshire, who had earlier been presented with the Stan Norris Trophy in recognition of his work during his Presidency, proposed the vote of thanks for a fascinating display. 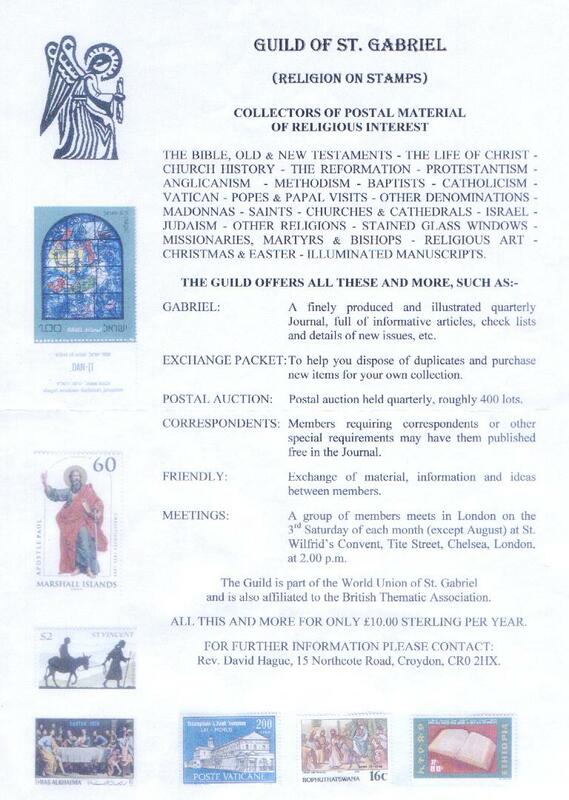 Interested in Religion on Stamps? Join the Guild of St. Gabriel.